CAMP KANGLEON, Palo, Leyte– At least two persons suspected to be involved in illegal drugs trade were arrested by the police in separate sting operations across the region January 27. Acting regional director Police Chief Supt. Henry Losañes informed that the intensified campaign against illegal drugs is in response to the present emphasis and demanding issues of drug law enforcement wherein drug pushers have become so aggressive in plying their trade. “The campaign against the proliferation of illegal drugs will always remain as one of our primary concerns,” the police regional chief said. 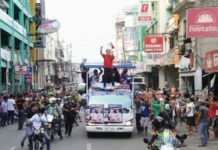 Losañes noted that while Eastern Visayas continues to be free from big-time drug syndicates, his office will nevertheless initiate an all-out campaign against street pushers and peddlers. In Maasin City, one Eric Salar alias Eric White, 36, was nabbed by joint operatives from the PRO8 Regional Intelligence Division (RID) and Southern Leyte Police Provincial Office (SLPPO) in a buy bust operation 3:30 p.m. on Jan.27 in Barangay Tagnipa. Confiscated from Salar were four small plastic sachets containing white crystalline substance suspected to be methamphetamine hydrochloride or “shabu” with an estimated market value of P2,000 and cash amounting to P1,021 believed to be proceeds from his illegal activity. Meantime, the implementation of search warrant in Brgy. PI Garcia in Naval town in Biliran province resulted in the arrest of 49-year old drug suspect Lito Aquino. 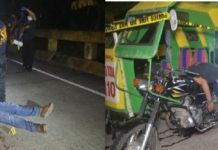 Acting on the strength of search warrant issued by Executive Judge Eprehem of the Regional Trial Court branch 18 in Hilongos, Leyte, a police team led by Police Chief Insp. Wilfredo Amordo raided the house of Aquino that also resulted in the seizure of six sachets of suspected “shabu”, P4,000 cash and several paraphernalia that includes digital weighing scales and lighters. Lawmen also confiscated one Colt caliber .45 and one Luger 9mm pistols and several rounds of ammunitions during the search. The suspects were brought to police stations for further investigation while recovered illegal items were brought to the Regional Crime Laboratory Office for examination. “We will make it sure that they will be spending the rest of their lives in jail,” Losañes said adding that drug charges were already filed against the arrested suspects.